An exceptional collection with an extroverted Futurist design, it is comprised by table lamps, folding wall lamps, ceiling lamps, semi-ceiling lamps with E/27 with 13W per light spot. As a prime representative piece, there is its large-scale floor lamp, which placed next to the wall provides indirect ambient light and thanks to its swivel joint and its telescopic system, it converts into a light to reinforce the living room or light up the room’s main table. It has a fibre structure and its powerful light source is provided by three low consumption E/27 of 23W. 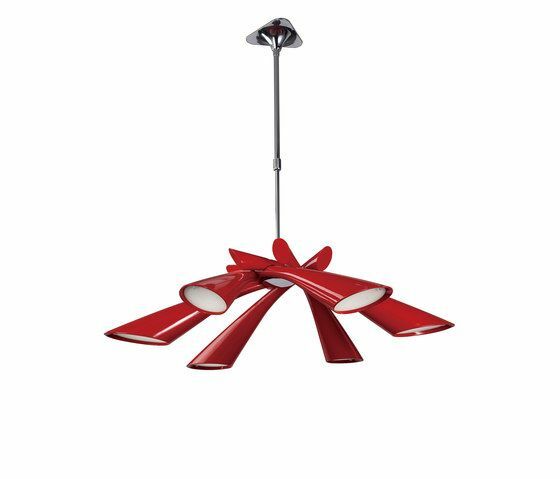 The remaining collection is manufactured in an aluminium injection process and its attractive shiny finishes are available in red, white and black. POP… in addition to being a source of light, its exceptional forms also create a unique avant-garde setting.